Dinner last night was a rather lonely affair – we were the only diners on our eight-seat table. Still, it meant we were able to have a quiet dinner together, and finish earlier than normal. This wasn’t a bad idea as we had an excursion today which meant setting the alarm. Last night’s passage from La Palma to Gran Canaria was quite bumpy. In fact Captain Breton warned us that it might be so because of an expected 9-foot swell. This doesn’t actually seem that much, so this tends to strengthen my current opinion that Arcadia does seem to roll quite readily. Today we’ve been in Gran Canaria. 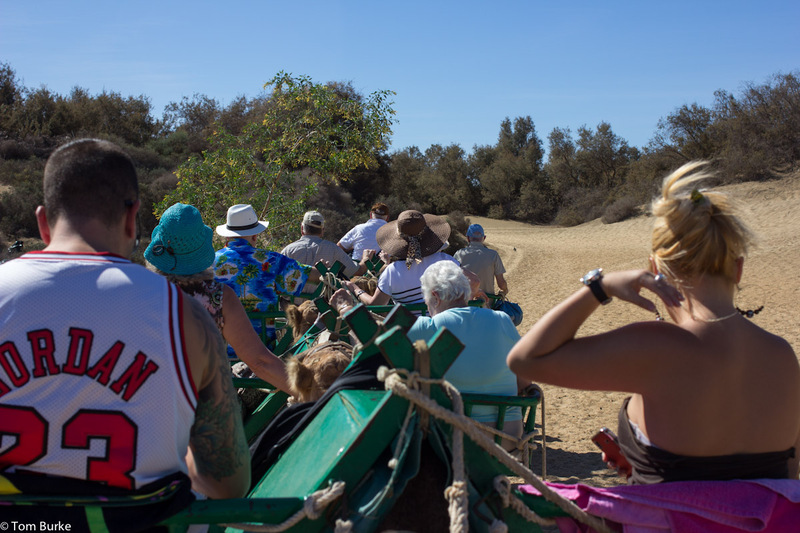 We had an excursion arranged – Camel Riding in the Masapalomas Dunes, plus a quick visit to a resort. It was only for four hours, and almost half of that time was spent in the coach. We visited a farm where young camels are raised, then went onto the dunes and had our camel ride, and finally on to a small resort and had some refreshments. It was actually great fun. I don’t feel any desire to repeat the experience, but as I said it was good fun doing it once. We also had the chance to see a bit of Gran Canaria on the coach drive – it was about 45 or 50 minutes from the port of Las Palmas down the motorway to the south of the island, and during the drive our excursion guide gave us some good commentary about Gran Canaria (he was a native) and indeed about the Canary Islands in general. I have to say that I don’t think the east coast of Gran Canaria could be called pretty, but never mind. 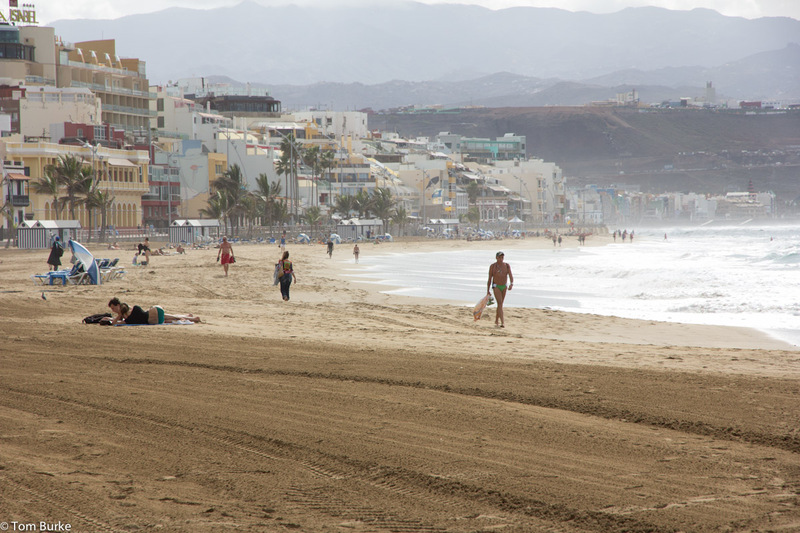 This afternoon we walked out to Playa Las Canteras, Las Palmas’ own beach, and the original centre of tourism on the island thirty or forty years ago. 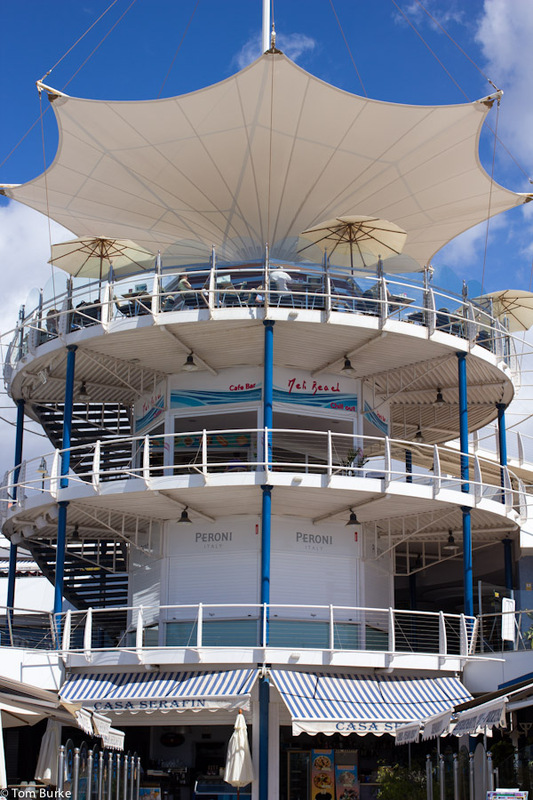 These days it’s been surpassed in visitor numbers by the resorts on the south coast, but Las Canteras is still an impressive long beach – about 4 kilometres – with attractive bars, restaurants and hotels behind it. We paddled, and got quite damp, but it was so warm (26 degrees or so) and sunny that our trousers dried off quickly. Then on the way back we found a gelateria and had a gelato each. Now it’s half-past five and we’re just moving off the berth. Leon (the cruise director) is running the Singalong Sailaway by the Aquarius pool, but we’re by the Neptune Pool where it’s quiet, and (mostly) sunny, with the roof open, enjoying our usual afternoon restorative – a bottle of sparkling water!